The Web Services data connector connects web services with VirtualSpace Fields and Tables as a web service consumer. SOAP (Simple Object Access Protocol versions 1.1 and 1.2) using WSDL definitions. The RESTful type is typically used for “simple” stateless services, whereas SOAP using WSDL is formal and more complex, also providing XML Schema validation of requests and replies. The REST services are more unpredictable than SOAP services as the reply can vary both in format and contents in many cases. The positive about REST is that the services generally are simple, easy to use and fast to implement. It is not the necessarily the service architecture that makes it so, often it is just the fact that the services are not so complex. Make sure that the Module project has the Web Services connector enabled in order to be able to define a new Web Service. The folder used in the Module project is . 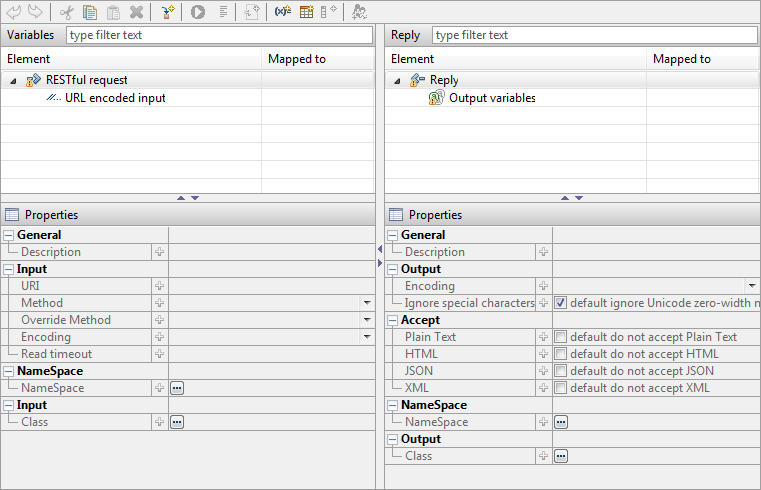 The Web Service Editor is divided into two areas; the left side is used for the request, i.e. for all parameters that makes up what is going to be sent to the remote party, and the right side for the remote reply that is received. The top part of each area consists of a tree structure of the request and the reply respectively. The bottom part contains a property editor to edit the selected item in the tree of the same area.